The Animal Gazer by Edgardo Franzosini is a novel based on the life of enigmatic sculptor Rembrandt Bugatti. Bugatti was the son of Carlo Bugatti, a renowned Italian decorator and designer of Art Nouveau furniture; Rembrandt’s brother was Ettore, the founder of the Bugatti automobile company. 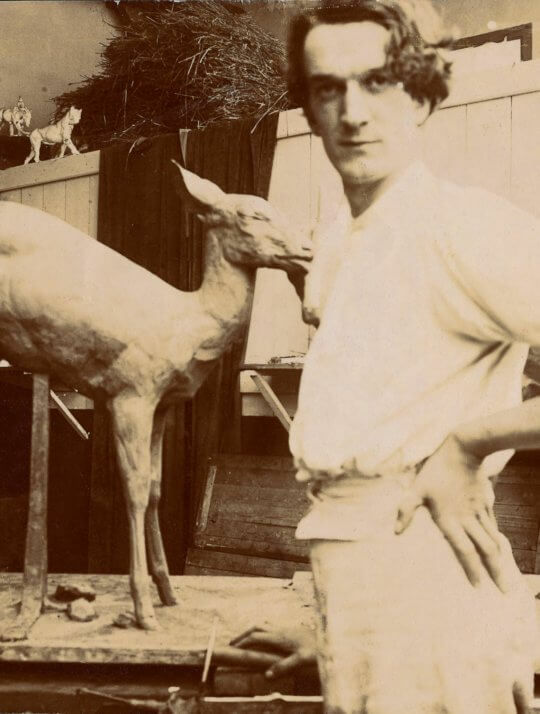 Many of Bugatti’s sculptures reflect the overwhelming love he felt for animals, a kinship that perhaps was closer than anything he felt to his fellow humans. The Sladmore Galley London has collected some of Bugatti’s sculptures and recently put on an exhibit at the Taylor | Graham Gallery in New York City—the latest in a series of exhibitions Sladmore has put on over the years. Below is a downloadable catalogue from a 2013 exhibit, titled “Emotions in Bronze,” featuring essays on and photographs of the artist and his work.